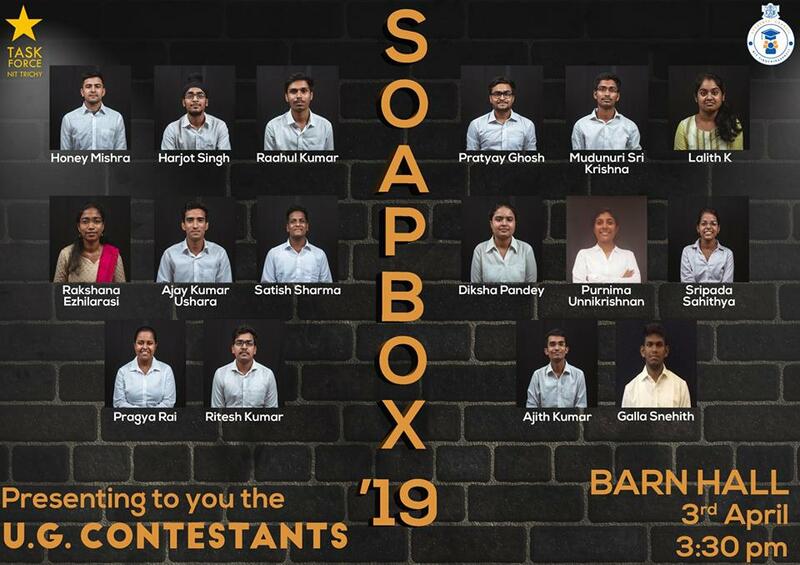 The fifth annual edition of SoapBox happened on 3rd April, 2019 at Barn Hall, featuring all the UG candidates running for Student Council (2019-20). This initiative by TaskForce in association with the current Student Council aims to give a voice to the candidates and help voters make an informed decision on electing their representatives. Each candidate presented their manifesto, followed by a discussion with the panel consisting of the current Student Council and Technical Council. The candidates also answered questions posed to them by the audience. The session started with manifesto presentation for the post of the Joint Secretary, who will be representing the second years (batch of 2022). This was followed by a discussion led by the panel. First up to speak was Harjot from mechanical, also the class representative for the past 2 semesters. He briefly covered his manifesto, starting with academic issues – 24×7 open library, awareness programs on internships, doubt/revision sessions and pre-planned holidays. With respect to campus development, he suggested setting up repairs shops for watches/spectacles and making printing in Octagon 24×7. He concluded his manifesto with promises on fixing restrooms in NSO, a cycle rental system, and celebrating more festivals on campus. Hoping to bridge the gap between the students and administration, Pratay spoke on creating a weekly portal to check attendance and hence eliminating shortage problems. He also promised to fix the computers present in Opal recreation room and hoped to create equality in facilities amongst all hostels. Sri Krishna to open printing 24×7 in Octagon and ensuring enough relevant books are available in the library. He also pitched the idea of organizing a sports day for each hostel and extension of sports centre timings, to inculcate a sporting culture in the campus. Coming to hostels, he mentioned about improving the condition of washing machines, transportation, and greenery on campus. He concluded by suggesting a ban on PET bottles on campus. Being the hostel representative of Diamond, Raahul affirmed his confidence in his knowledge of admin procedures. He spoke about improving swimming pool timings, opening a shop for electrical and mechanical parts, and setting up cycle lending. He pitched an idea of starting mock clubs for first years. He suggested revising bus timings, auto fares and dress code in Octagon past 11 pm. He ended with addressing the cycle theft issue by building well-maintained sheds on campus. Honey started off with touching upon the issue of water scarcity and green cover on campus. He suggested sheds covering common paths, making WiFi available 24×7 and timely inspections of NITT hospital doctors. He concluded by saying he was open to suggestions from students. The panel started off by asking the candidates if they knew what their responsibilities are as listed in the circular. After they listed a few, the panel questioned their manifestos as hostel responsibilities were not in their hand and informed them that there will be a separate hostel council the next year. The panel then questioned them on their knowledge on existing RO plants, transport and responsibilities of being a member of the horticulture committee. The post of Additional Joint Secretary was contested by Lalith Kothandaraman from Civil and Rakshana Ezhilarasi from Chemical Engineering, both of them in their B.Tech first year. Lalith was first to present her manifesto. She promised that she would relax the curfew timings in Opal, especially for girls who wish to utilize facilities like Octagon, Siemens Centre and the library. She also touched upon the need for installing more computers in Octa and provision of higher number of washing machines, sanitary napkins, TVs and vending machines in Opal. She also promised to increase the quality of the mess food and the bandwidth of the WiFi in hostels. She proposed to implement cycle rental services across the campus and allowing men to enter Opal on the first and last days of a particular semester. Rakshana’s manifesto emphasized on the need to have a better curriculum structure. She also pointed out the shortage in the number of battery cars in the campus and that she will be working towards increasing this number. She stressed on the need to simplify the MIS system due to the difficulty in comprehending it. Her manifesto also included controlling the number of stray dogs in the campus and implementation of animal care programmes. The panel quizzed the candidates on the responsibilities of an additional joint secretary. The panel also sought the candidates’ opinions on their roles as a part of the Safety and Security Committee. The issue of electives and minors was also discussed. The General Secretary post will be fought between the second years – Mr. Ajay Kumar Ushara of the Civil engineering department and Mr. Satish Sharma of Metallurgy and Materials Engineering department. The agenda was as follows: The two would present their manifestos, followed by which the panel consisting of members of the student council would ask questions, following which, the two candidates would engage in a crossfire and would leave the floor to audience questions. Ajay Kumar Ushara highlighted a few points on his manifesto which included: Introduction of an Intern cell for students who do not secure a research internship. His campus development agenda included the return of cycle rentals, animal-proof bins to highlight a few. He also promised the introduction of a NITT-centric Women’s safety app, and a regularly updated blog highlighting the steps taken by the student council among many other points. It was then, Satish Sharma’s turn. His promises included: Introduction of a portal highlighting various projects done by the clubs and other individuals, so as to get alumni involved in funding the existing and future projects. Introduction of LAN or WiFi at SAC, providing funding for a GPU subscription of clubs requiring usage of new software, development of sporting areas that have been left in an unusable state, and having a process to ensure that the students passing out of college can donate their possessions for future use. A question-answer session followed, the panel started off by asking the 2 candidates to list out the responsibilities of the General Secretary, which were: To be the chairman of NITTFEST, Organize ‘Nostalgia’, be a member of Alumni Interaction cell, and Office of International Relations to name a few. Ajay was asked to then explain his idea of the Intern cell, where he elaborated that it would help deserving students, who aren’t in the most academically favourable position to secure a research internship but are very much interested in a particular field. It would contain a portal where the student would enter his/her requisite details and choose their field of interest. A professor would then call in the student for an interview, to test the student’s knowledge in that field and accordingly select student(s) based on their knowledge of the given topic alone. Satish was then asked about the steps he would take as a member of the alumni interaction cell, to which he talked about how the tech clubs and other individuals can upload their projects and alumni can help fund these projects. He was then asked about his duties as a member of the Transportation advisory committee, where he had mentioned that only 2 buses and 2 battery cars are currently functional, and thus, he suggested issuing new tenders for buying buses. Mr. Shivam Sharma, the outgoing president, pointed out that the ministry does not allow buying of vehicles any more, and instead suggested issuing tenders to outsource private buses to work for in-campus transport. The panel then asked the two about a common point mentioned in their manifestos, which was about cycle rentals. Mr. Satish suggested bringing back a similar service like Recycle by getting cycles from outgoing fourth years, which are of better quality over the usual cycles Recycle had (which was one of the reasons why Recycle’s services ended). These cycles would be used as a rental service. He also suggested bringing in Permanent staff to take care of the rental cycles and using the rental fees to pay them. Mr. Ajay tried contacting Ola Pedal for some estimates and didn’t receive a response on the day of the soapbox. Mr.Shivam pointed out that Ola pedal had been a failed service, especially on large campuses as there is no one to take care of the docking stations where one has to park their cycles. Mr. Ajay instead suggested having a similar service as Ola pedal, where each person pays a fee and can use any of the cycles for a certain period, these cycles would have the same lock combination, so it would reduce the hassles of taking care of the cycles when it is docked. The two candidates were also asked about their responsibilities in NITTFEST, and as to how they would prioritize executing the duties of Gen Sec and Chairman of NITTFEST. Both agreed that being chairman does take up a lot of time, however, they promised that they would execute the job of General Secretary first, and would have a more supervisory role as Chairman of NITTFEST since it is run by a team of students. A crossfire session then began, where Mr. Satish asked Mr. Ajay about his plans for the Women’s safety app. Mr. Ajay mentioned that Women around campus can list their grievances, and the app would also have an emergency button which would notify the Security office in case of an issue. Mr. Ajay then asked Mr. Satish about his plans for renovating playgrounds. Mr. Satish said that his plan is to now look at renovating the Lapis and Amber grounds, and would look at solutions to bring in proper lighting at many of the play-areas. Audience questions were asked as well including a question from an Alumni (in-absentia), who wanted to know about their plans for supporting entrepreneurship enthusiasts and the initiatives they will take for promoting entrepreneurship among students. The two promised proper admin support for entrepreneurship enthusiasts, regardless of them being in a tech club. The post of Additional General Secretary was contested by three second years – Diksha Pandey from Electrical and Electronics Engineering Department, Sahithya Sripada from 2nd year Metallurgical and Materials Engineering department and Purnima Unnikrishnan, also from Electrical and Electronics Engineering Department. One after the other, the three candidates gave their opening addresses, highlighting their stances. They went on to debrief the panel about the specific details contained in their manifestos, which had been released earlier in the week for the counsel’s perusal. Diksha Pandey started off by suggesting a change in the MIS feedback system, which, in her opinion would be more inclusive and would include representation from the students’ side. She also suggested infrastructural upgrades like construction and maintenance of washrooms in the Student Activity Centre (SAC) and the upgrading and expansion of the parking space in Orion and LHC. She put forth the introduction of language labs for the 3rd and 4th years, which would be helpful in the GD and HR rounds of their placement and training processes. She suggested an Equity Action Plan, allowing girls access to certain facilities like the Octagon and SCIEnT lab post curfew hours. The issue of a night canteen in Opal was also mentioned by her. Purnima Unnikrishnan viewed this stage as an opportunity to give back to the college by doing her bit as the Additional General Secretary. She put forth a new idea regarding the course registration process which could, she suggested, reduce the panic amongst students during registration for the required courses. Her primary agenda in the academic sphere was to introduce a compulsory project in the first year which could help bridge the skill gap prevalent in the first years and prepare them for the following semesters. She suggested a biometric system of roll call for girls. These would be placed at places like the CoE and SCIEnT and the stewards of the respective hostels could be kept informed about their location. This, she suggested, could help improve the participation of girls in technical clubs. She also suggested an improvement in the number of washrooms in the campus. She suggested a change in the structure of the ICC – Internal Complaints Committee of the college, feeling the need for student involvement. Serving as the hostel representative, she feels she has the experience of listening to the concerns of the people around her and working upon them to present them to the authorities in an ideal manner. Her manifesto placed importance of clarity about the elective process in the 4th semester. She also put forth the need for a more transparent system for the scholarships offered, so that the reach of the same is improved. Under estate development, she promised to set up drinking water dispensers in public places. She commented on reviving the green initiative and improving the green cover inside the campus. She suggested a better waste disposal system all around campus, which was received well. She was in favour of increased alumni interaction. She promised to take steps to ensure Wi-Fi facility beyond the current 1 A.M. timing. The three candidates were questioned on the various aspects of their manifestos, of which the first one was the MIS and the feedback system. The grievance of the “On Duty” forms, was also brought up. The President clarified the stance by chalking out the whole process of the OD system, which cleared the matter up. The session was ended cordially. This year there was only one candidate, Pragya Rai, a third year Production Engineering student. She started off her speech explaining as to why she was standing for the post – a sense of responsibility and affection to bring about change and make the campus a better place. Her speech elaborated on all the points covered in her manifesto which were divided into 5 main categories i.e. academic, campus development, sports, student activities and NITT App. Shivam, the current president started off by asking Pragya to list out her responsibilities which include: executive committee member of Pragyan; member of student scholarships committee; planning, expansion and diversification of institutional activities; coordinate with office of international and alumni relations; member of safety and security advisory committee; member of girl students’ grievance committee and academics related activities of 4th year. He asked her as to why her manifesto did not cover anything related to Pragyan to which she said that the new core hasn’t been formed yet and she did not want to make any unilateral promises. He further asked her if she was aware of all the scholarships offered to which she replied that she wasn’t. From the audience, there were questions regarding security issues arising from the entry of male workers into Opal, and the responsibility of council members to be more communicative with students who are facing enquiries. The post of Student Council President was contested by three candidates – Ajith Kumar, Galla Snehith, and Ritesh Kumar. The session started with each of the candidates introducing themselves and presenting their manifestos to the house. They talked about all the different kinds of initiatives they planned to take up over various categories like academics, campus development, student activities, and sports activities. The presentation was followed by a Q&A session. During the session, Shivam and the current Student Council asked a number of questions regarding the various responsibilities of the President including being an executive committee member of Festember, allocation of student funds for various activities, the functioning of the Estate of Welfare Committee, institute scholarships, and academic activities. Over the course of the panel’s questions, a number of ideas and plans for the next year were brought up. Snehith talked about how Festember food stalls are often badly affected due to the rain and students are unable to use their food cards and his intention to find a solution to this problem. With respect to allocation of funds for student activities, Ritesh felt that the way forward is to compare the previous year’s expenses and performances, and their plans for the future. Each candidate had unique plans with regards to academic related activities. Ajith spoke about his vision for a ScIENT portal for professors to put up projects and students can create accounts on the same portal and apply for these projects thus streamlining the process for both parties. Snehith brought up a recent meeting organised by the Chemical department with the current 3rd years and 4th years as well as industry professionals to discuss the existing curriculum in detail before the next BoS meeting. He felt that this could be adapted to all the departments to give the students more of a voice in the formulation of curricula rather than it being a one sided affair. Ritesh elaborated on his idea for “zero credit courses” for students to try their hand in different minor courses before deciding which one they are going to stick with. However, Jittam did point out that such an idea will have serious challenges considering the number of faculty currently working on campus. A situational question was also posed to the candidates by the panel in which their friend was caught participating in illegal activities in the hostel. The aim of the question was to see how each candidate would handle such an incident and this prompted a long discussion on the topic. Ajith was strongly in favour of counselling and a warning as the first step in handling such situations. He and Ritesh also talked about how the college should try to cut off the problem at source. The panel was quick to point out the difficulty of this suggestion due to the jurisdiction of the council being limited to the college campus only. The three contestants were also unanimous in their stance to suspend repeating offenders from the hostels. Snehith also said there should be a more regularized rulebook for such situations that take the severity of the offence into account to add more consistency and transparency to the decisions taken. Availability of drinking water, the pros and cons of RO dispensers, and the state of the existing water coolers was another big talking point throughout the session. The crossfire session began with Ajith questioning Snehith and Ritesh on their plans for the NITT app. His main point was that the type of app suggested in their manifestos has a high risk of information leakage which the admin cannot afford. Snehith’s idea of transferable credits from online course outlets like NPTEL and Swayam also came up. However, the student council pointed out that this idea has already been approved and will be implemented soon.